Izzy had so much fun with her birthday and Christmas sewing classes at Crafty Planet that I was inspired to return the favor to Auntie Karen. 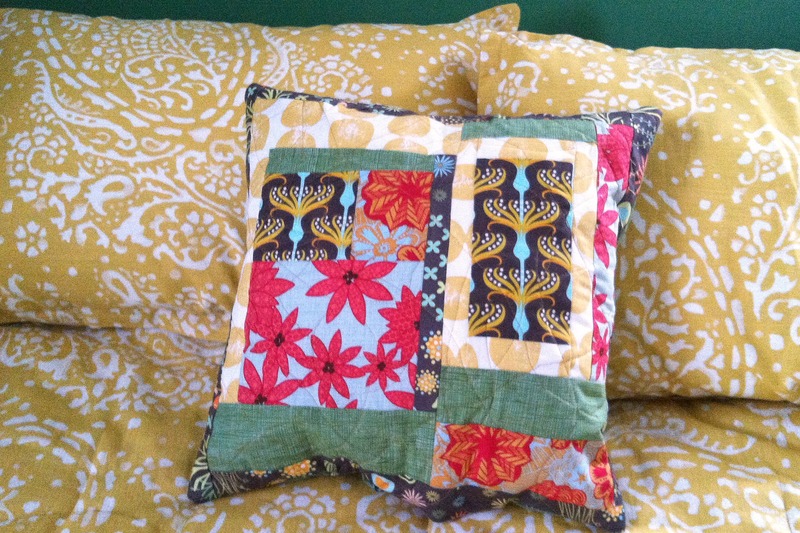 The three of us took a private Freeform Quilting Pillow class for Karen’s birthday. It was a blast. 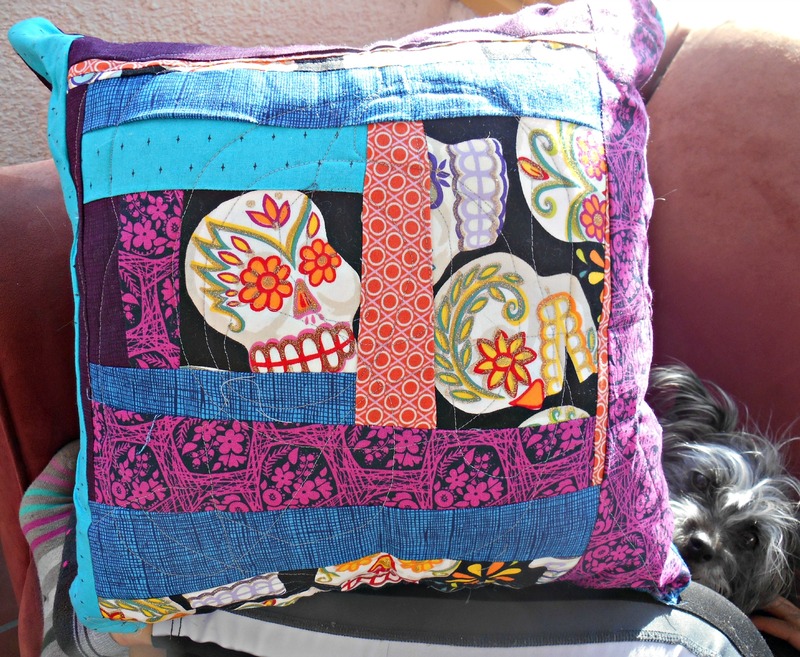 No surprise, Izzy was a pro and finished her quilted front, made a pieced back, and sewed up three sides of the pillow so she just had to insert a pillow form when we got home. 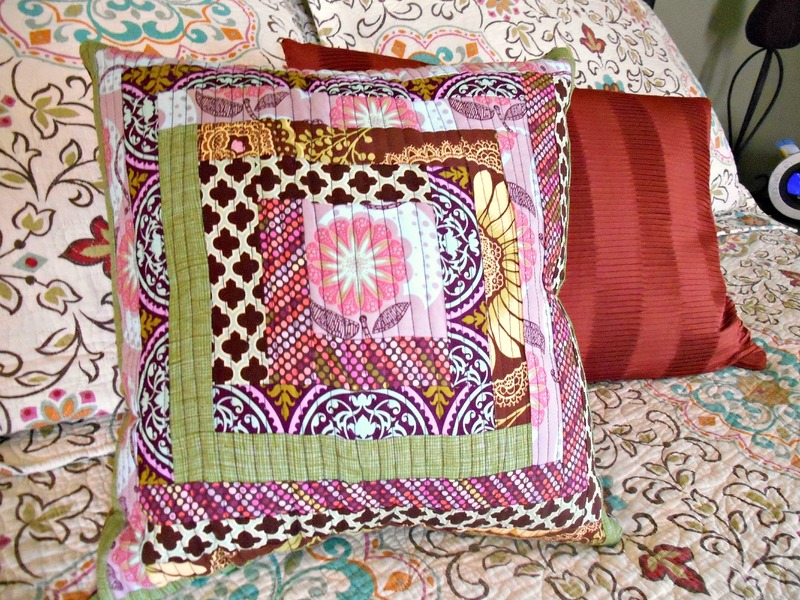 Karen finished her quilted front, bought fabric for the back, and finished up her pillow at home that night, too. 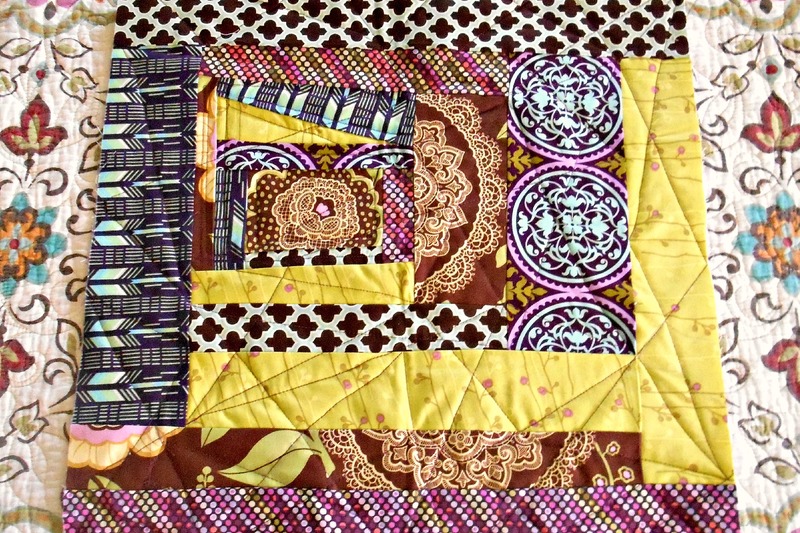 And then there was me… I finished the quilted front and bought backing fabric. But when I got home, I realized that while I love an acid green, I don’t have that color in my bedroom. You’d think I’d remember that. So back I went last weekend to buy some more fabric. Today, I made version 2 at home and the timing was perfect. There’s spring in the air. What better way to celebrate the end of winter than to retire the flannel sheets, put on cotton bedding, and top it off with a new floral pillow? BTW, this sewing thing? It could get addictive. And just to be clear: I had nothing to do with creating this video — despite the fact that it features knitting, ice skating, and a dog in a sweater that looks an awful lot like Violet. 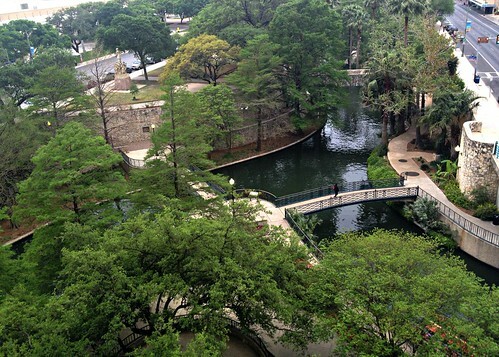 Last Friday, I awoke to this view outside my hotel window in San Antonio. Sure, I had to work all weekend, but it seemed a fair trade since it was spitting sleet and snow in Minnesota when we headed out to the National Science Teachers Association. Much of that mess had melted by the time my plane touched back down on Sunday afternoon. And it continued to melt over the next few days. Since I like to think of this blog as family friendly, I’ll skip sharing my initial outburst at awaking to this view today. Two thing helped cheer me up…slightly. 1) I’d already arranged to work from home today. 2) Izzy gleefully grabbed three FOs to layer up for her walk to the bus. 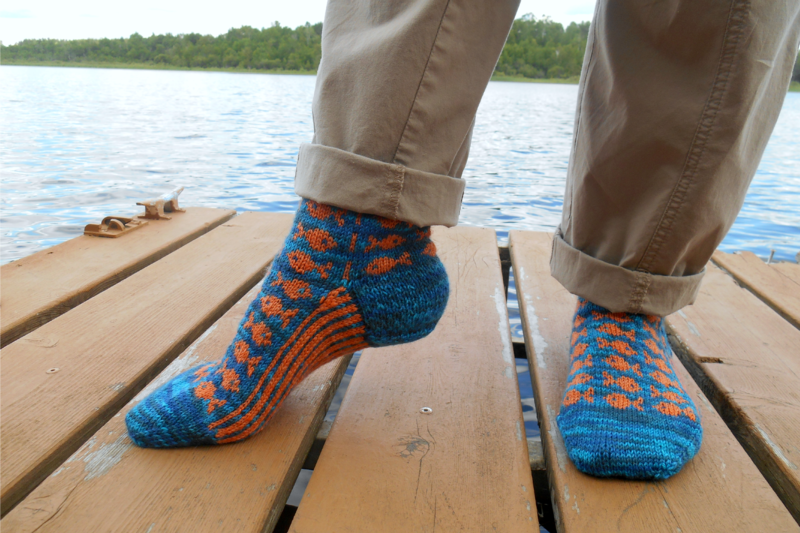 That said, I’d like to make it loud and clear that as much as I appreciated Minnesota bringing the knitting weather this fall and winter, I’m ready for spring. Now. Enough already and (hopefully) enough said. When I’d made the decision to move back, I went hunting in Ravelry for the appropriate winter headwear. Preferably not a hat. (I’ll save my hat issues for another post.) 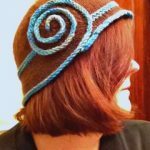 I wanted something warm that I could wrap around my whole head, but with enough style that I wouldn’t mind being seen in public. 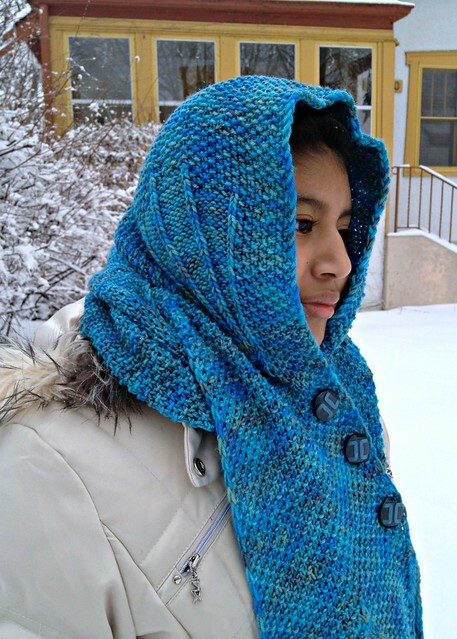 This hooded scarf from Whimsical Little Knits 2 completely charmed me. 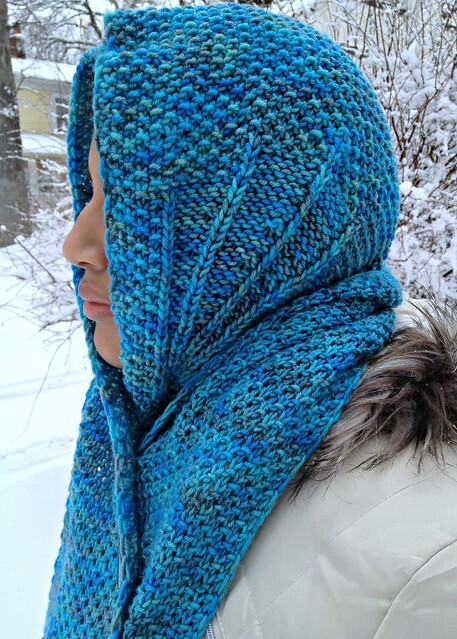 What’s not to love about those shell details over the ears and on the scarf ends? Then, soon after, I scored this OOAK in a TFA Etsy sale. 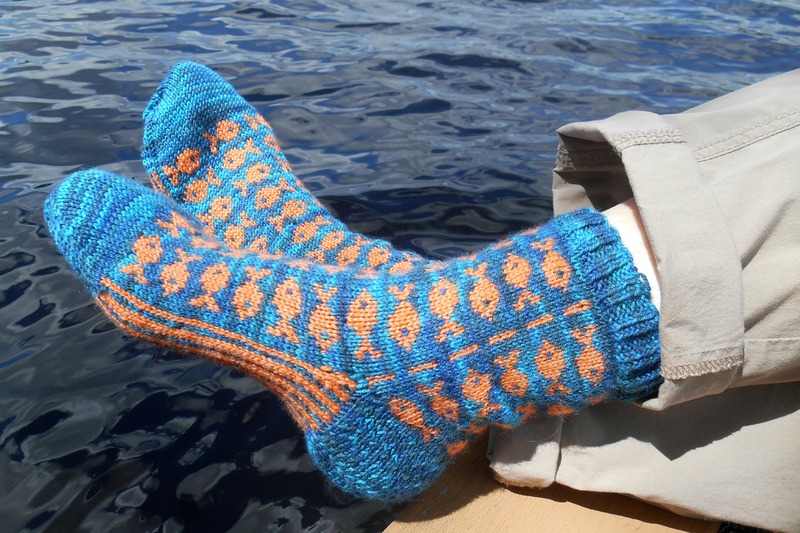 The perfect pairing of yarn and pattern. I won’t lie. The miles of seed stitch got a bit taxing. 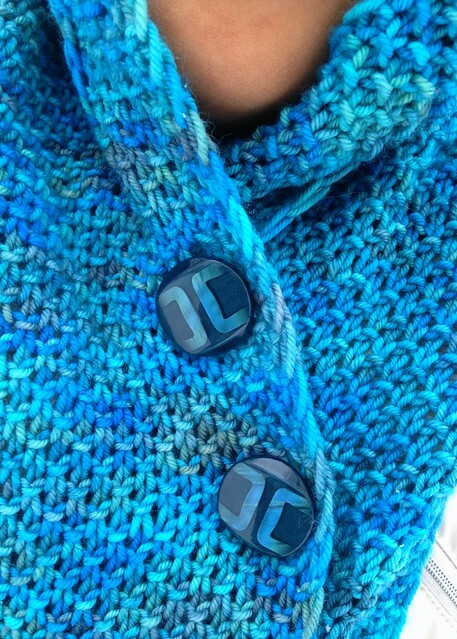 But I knew they would make the fabric warm — worth it, and so I kept knitting… Then I went button shopping to spur me through the final section. Hooray for 50% off sales! Not sure I otherwise could have justified the button upgrade. Best part, though? I finished it just in time for the latest snowstorm. 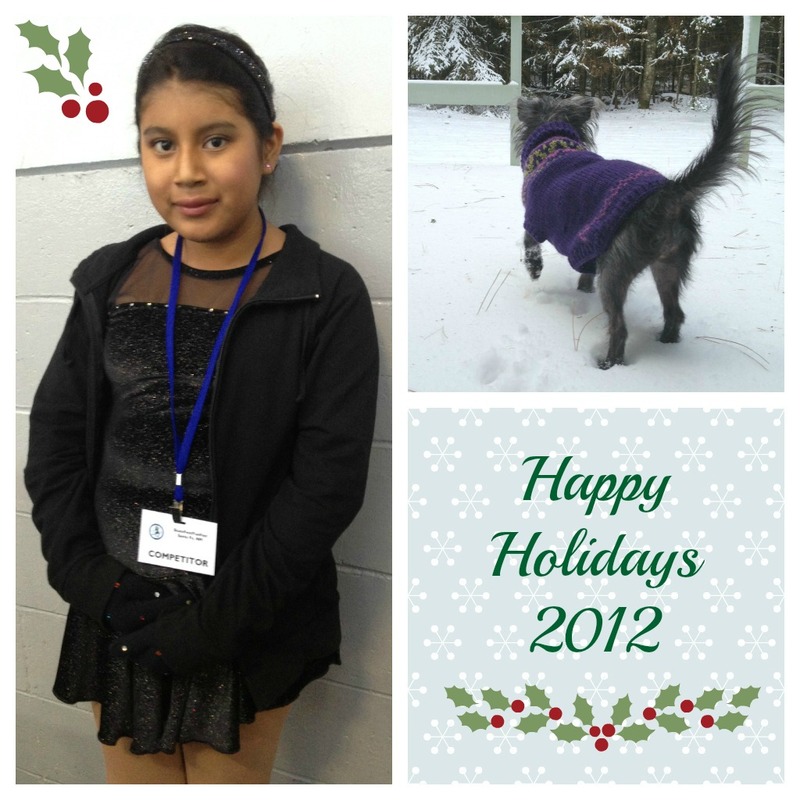 Happy Holidays: May your days (and knitting) be merry and bright! The countdown to Halloween is on. 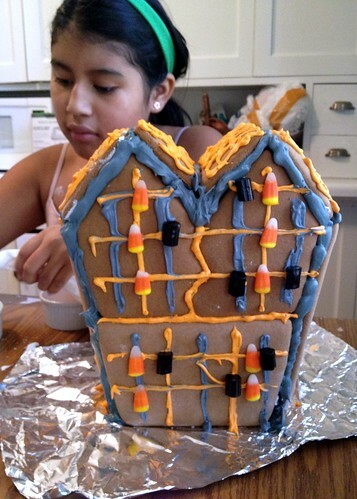 While final decisions are still being made about Izzy’s costume, the decorating has begun. 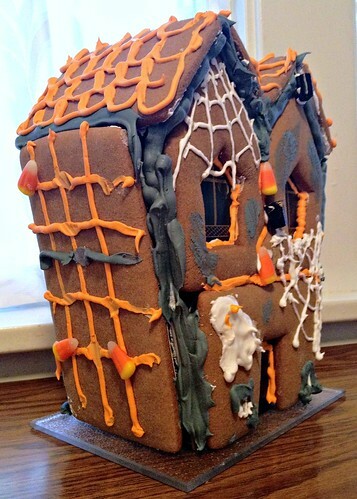 We started with this Haunted Gingerbread House — a good Sunday afternoon activity after a week of battling off the latest bug. And while we have made gingerbread from scratch, I fully embraced this no-cooking required kit. I mean, the decorating is 98% of the fun, right? Hello, Fall. How I’ve missed you. In Albuquerque, the air turns crisp around Thanksgiving. For a “fall is my favorite season” person, the September equinox is a strange sort of torture: “It’s nearly October. The kids are settled back in school. 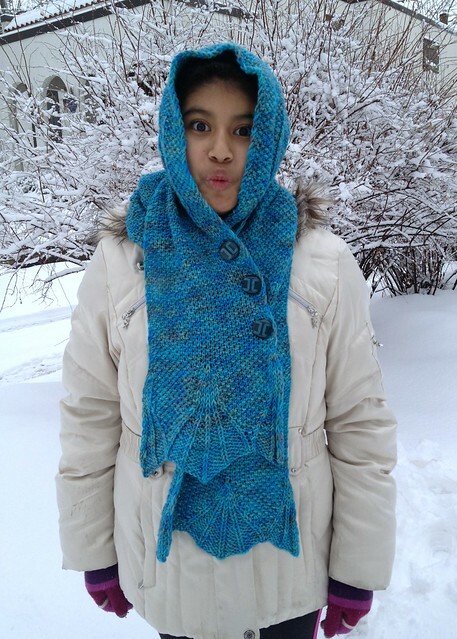 Why can’t I pull out my woolens? 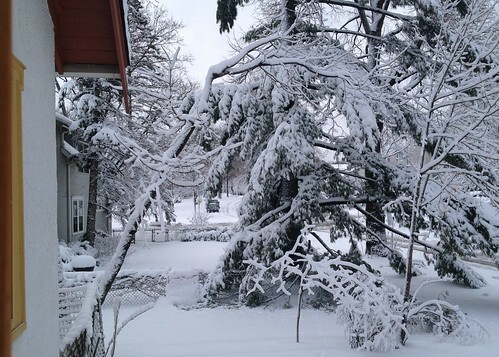 !” Happily, Minnesota is bringing it this year — even throwing in a first frost warning on the 23rd. 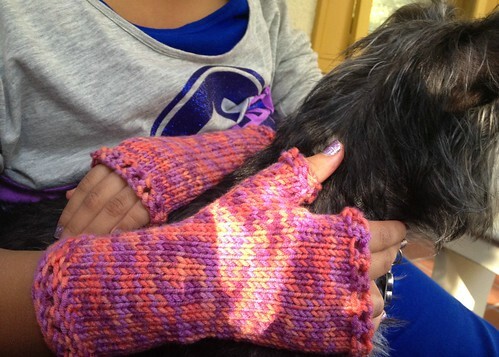 Faced with chilly mornings, the kid started asking for a pair of fingerless mitts. 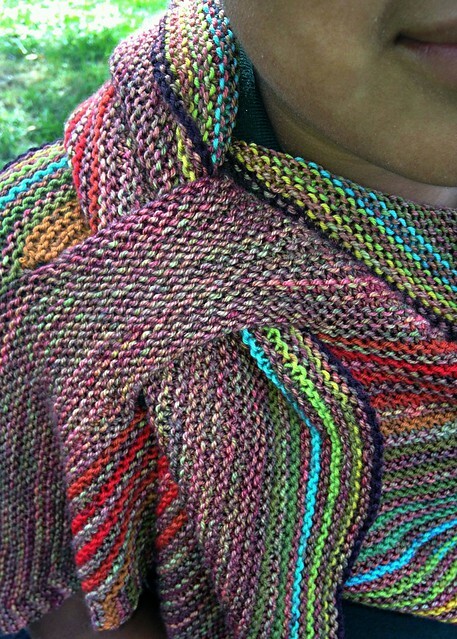 We went stash diving last weekend and found three skeins of tween-perfect bright. 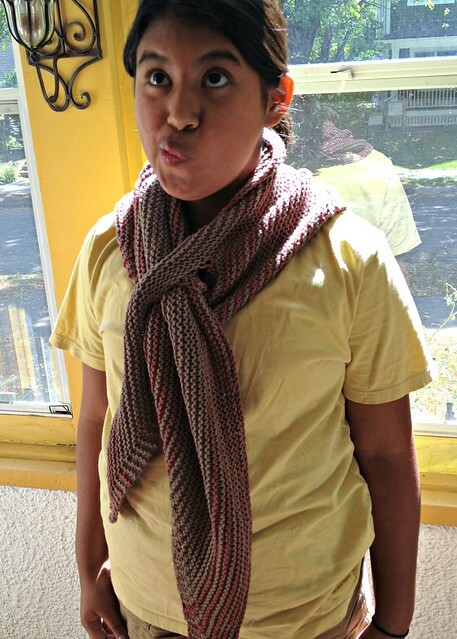 (Matching cowl now on the needles, thank you.) 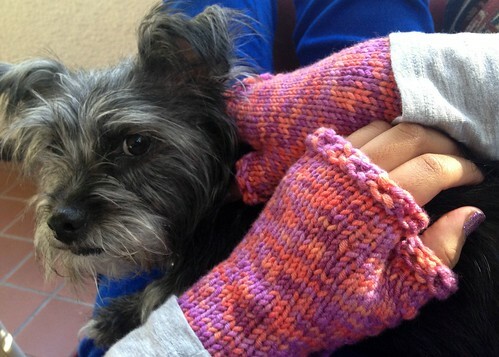 The yarn is also superwash wool, so the mitts just might survive beyond the season. Violet is a bit more skeptical about the September chill. Since they knew we were headed back to MN, my sister and brother-in-law gave me a birthday gift certificate to another new yarn store that had opened in Minneapolis during our stay in Albuquerque. (This place is fiber heaven!) Rather than spending it right away online, I decided to exercise some rare restraint and wait a few months so I could visit in person… As luck would have it, I traveled to Mpls a few weeks later for an interview (for the job I got, yay! 😉 and visited Bella Lana over Memorial Day weekend. 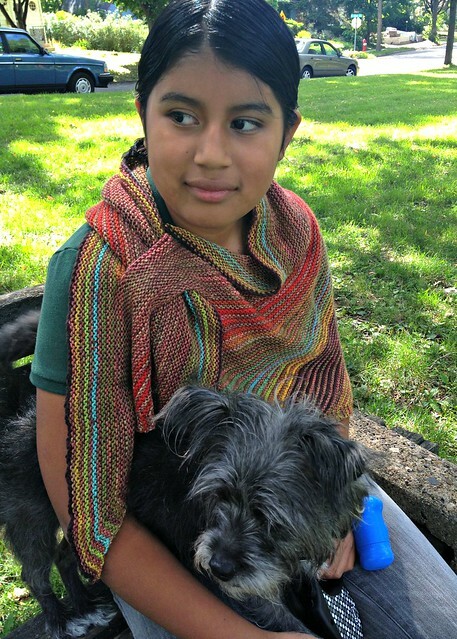 Being the total geek that I am, I traveled with the last skein I planned to purchased in NM and the goal of buying a complementary skein in MN to create a symbolic transition knit. Yep, total geek! Here’s my “Two-State Scalene,” which I love for more than just the silly sentimental reasons. Beyond the great mix of color stripes in the Unisono, my favorite detail is the double keyholes, which make the Scalene so easy to wear.